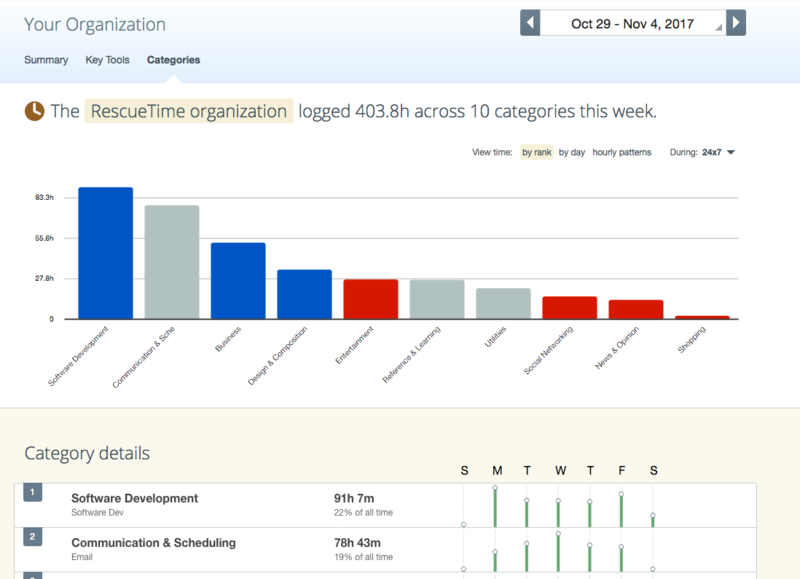 The group reports in RescueTime for organizations help the team visualize their cumulative time and understand how they are working together as a group. They include rollup statistics about how time was spent in different categories at different times of the day or week. 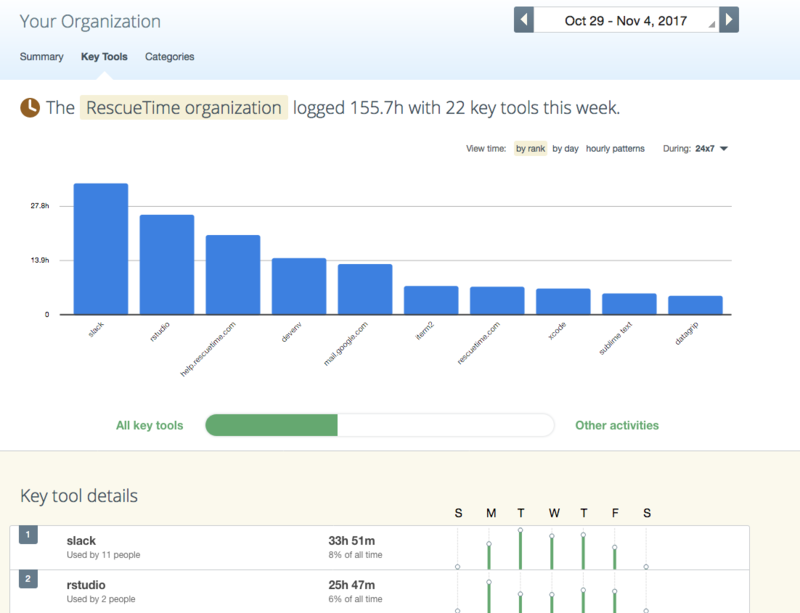 If key tools are configured, your team can also see how their time in specific tools is adding up. The reports are a tool for the entire group to see how they are working as a team. As such, they are available to all members. It lets individuals see benchmarks of team norms, and helps them understand their place in the group. Time-tracking systems within an organization often raise questions by those being tracked, and one of the best ways to address any concerns is to let team members see what data is available in the reports. These reports should be both a tool to help managers make smart choices about the overall team time-management strategy and a source of valuable context for the individuals on the team. The group reports only contain anonymized, aggregated information about how the team as a whole is spending its time. A manager cannot drill down into an individual's private details. Group time is aggregated, and in most cases rolled up to the category level. Key tools are the only activities that will be displayed explicitly in the reports. This helps ensure the privacy of your team members and cuts down on a lot of noise that would otherwise make the reports a mess. 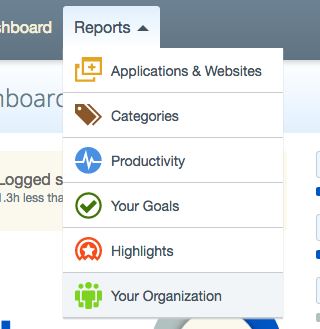 You can access the group reports by clicking Reports in the top navigation, and choose Your Organization. The summary report gives a high-level overview of how the team is spending its time. You will be able to see the total time logged for the team, the time by day, top categories and key tools, and a breakdown of patterns throughout the day. You can adjust the date and time frame using the date controls at the top of the page. You can also view time by day, week, month, or year. The categories report shows a detailed analysis of how time is spent across different categories. For the selected period you can see the total time in each category as well as a breakdown of how that time was spent during hours, days, or weeks. The key tools report shows a detailed breakdown of how time is spent in the different key tools you have configured. For the selected period, you can see the total time in each key tool as well as a breakdown of how that time was spent across hours, days, or weeks.